I woke up on Wednesday with no intention of buying a car any time in the next 12 months. 36 hours later I was signing the contracts for a new car. So uh, how did I get here, sitting in a beastly new (to me) Toyota Prado? My old car, a trusty old Mitsubishi Magna was beginning to show its age. A few costly repair jobs were done on it earlier in the year, and a few more are just around the corner. It wasn't getting any younger - it was 19 years old this July - so I planned on replacing it sometime in 6-12 months. With lots more snow trips in the future as well as job prospects in regional areas, I wanted a 4-wheel drive. Ideally a Landcruiser, finances permitting. On Wednesday I was sitting in a very boring class being taught something not related to the assessments in that class, so like everyone else I had tuned out. I started casually browsing carsales.com.au, seeing what a used Landcruiser was worth. My heart sank. Most were above $50,000 - a figure uni students only ever see in their HECS debts - so the dream seemed out of reach, until one entry. 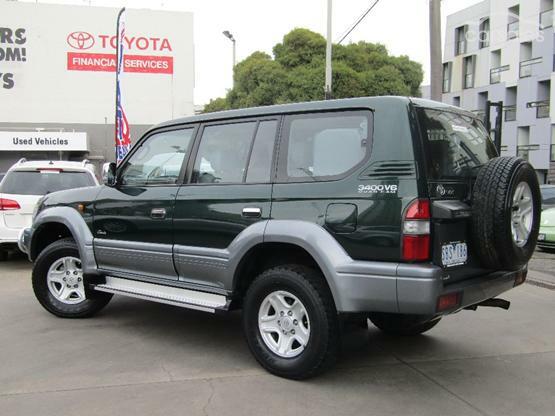 A 1998 Landcruiser Prado, just as old as my current car. The listing showed low kilometres and barely any use, enough to pique my interest. I show up at the lot the next day to check the car out. Steve and I got reacquainted and then down to business. Hoping they have cars like this show up every now and then, I asked him how often a car this old and in such good condition come through the dealership. He responded, "Mate, never. We never get these sorts of cars in." At that point I knew this car was mine. Everything else was just formality. I looked at the car and everything was immaculate, I don't think anyone has driven it this century. We took it for a spin around North Melbourne and it ran beautifully. Back in Steve's office, he offered a generous discount on the list price and threw in a set of new tyres. He offered to take my old Magna for a paltry sum, a favour to take it off my hands more than anything. So with contracts signed and all the paperwork in order, I am the proud owner of a new (to me) Toyota Prado. I'll pick it up Tuesday, almost five years to the day that I got my license. I'm no superstitious man, but everything seemed to fall into place, to the point where even the rego plate is perfect - SBS 186 - you couldn't get a more auspicious plate for a journo! Over the weekend, I'll take the Magna for one last drive. Saying goodbye to my first car has left me feeling sentimental, might make a blog post later in the week about it. If you'd like to know about new posts on this blog, as well as all the other stuff I do on the internet, why not sign up to my weekly email newsletter? In order to succeed against fierce competition, one needs to be single minded about what they are doing. Sun Tzu says you need to be ardent - very enthusiastic or passionate - when starting out. The Big Thing is reflected in a lot of the smaller stuff that I'm working on, in this blog, and everything I am doing right now. You could say I'm ardently pursuing it. The big thing is launching a journalism career. It's a tumultuous time for the industry. Everyone from CEOs to students are scratching their heads trying to figure out where it's headed. Nobody has figured out the future of journalism - if anyone has, they would be billionaires - but that doesn't change the primary goals of journalists. We tell stories to inform the public and make voices heard. To put things optimistically, more people than ever before are reading the news. More countries have access to independent journalism than ever before. But according to Reuters only 13% of Australians are willing to pay for online news, the only place where media consumption is steadily growing. Where does that leave an industry starved of revenue? Like everyone else, I have no idea where this industry is headed. We see steep cost cutting, job losses and redundancies at every major news organisation. Despite all this, the need for people to tell the public what's going on will never disappear, society will always need people informing them. They need people to expose corruption and everything else that journalists do. Oh, and it sure beats any other office job. Why sit in front of a computer staring at spreadsheets when you can get a job driving around asking important people dumb questions? A YouTuber I watch did a series where he talked about all the things he was doing by separating it all into little, medium and big things. When I looked at this website the other day, I realised the entire about me section was blank. What was I thinking when making this website? There's no better way to kick off this blog than to tall you a bit about myself. Here's what I'm up to at the moment, starting with the Little Things. With everything else going on in my life, photography has taken a back seat this year. I dabbled in event photography for a few years with some success, but the intensity of my studies and internships has relegated this side hustle to the Little Things. I still take photos though, and if you need a photographer for your next event, or anything else really, just hit me up (shameless plug). Some friends got me into D&D about five years ago and we would get together most weeks to play it. That group sort of faded away last year as we moved onto new things, but it hasn't stopped me playing. A few months ago a buddy of mine started hosting a D&D campaign over Skype from Iceland, where we have people calling in from Singapore, Melbourne and the US. It's sometimes difficult managing all those time zones, but when we do get together, it's such a great time. The challenge, adventure and socialising are a really great mix. I've never been good at explaining what D&D is to people who aren't familiar with it, but this explains it really well. I might write up the next session on this blog to give you an idea of what it's like too. I have broken every phone I've ever owned, except the one I currently use (but that's only a matter of time). When I smashed my iPhone 4 at a tram stop in 2012, I decided to teach myself how to repair it. With a little know how and several hours of patient work I figured it out and won myself a good as new phone. Over the next two years I offered repair services to anyone who would pay me to fix their phone, eventually branching out into iPads. After phone repair shops started popping up everywhere and slashing their prices I just couldn't compete. Parts suppliers began dropping their standards and that resulted in problems with reliability. Eventually I packed it in, the headaches it caused me obliterated any enjoyment it gave me. I still repair the occasional phone for friends and family and enjoy this little hobby so much more now. I've put this in the Little Things category, but I really want to start hitting the slopes more often. I went to Mt Hotham for school camp years ago and loved it. Last year I revisited the snow and getting back on the board was just like riding a bike, though the video I made didn't look that way. I'm not very sporty so it's nice to have a physical activity that I enjoy. The ski resorts in Australia aren't much by world standards, but it's pretty good for a country that's 70% desert. Maybe someday I'll snowboard overseas, but for now I'll settle for a three hour drive to Mt Buller. For most of high school I refused to read anything. Call it a rebellion against my intellectual side or something... school wasn't easy growing up a geek in a backwater town. In my first year of uni that began to change, and in the last few years I've developed an insatiable appetite for reading. I read a ton of books during my gap year in 2016, but with less disposable time on my hands this year reading has been relegated to the Little Things just like photography. Even so, I've been pushing myself to read at least one book each week, a goal I've somehow kept up with among everything else. So that's the little things, all the stuff I use to fill spare time. In the next post I'll go through the Medium Things, all the stuff that are more than just hobbies.